I’m one of those people that loves the outdoors, but I’m not outdoorsy. If you’re raising your eyebrow and wondering if that’s a type, it’s not. Allow me to explain. I love to be outside, I just don’t want to sleep there or really exude any type of strenuous effort while outside. My outdoorsy side embraces sunshine laden hammocks, porch swings, grassy hills, and watching my children play. I love cold drinks and bare feet and the smell of sunscreen. I also love hot showers, clean pajamas and using indoor plumbing. These backyard projects will make you want to be more outside as well. Here are a few of my most recent ideas to spruce up the backyard. A hammock. You guys, this is my happy place and look at those pillows and a light blanket, I literally sit and read in mine for hours, when my kids aren’t dying for a turn. How awesome is this giant outdoor movie screen? This would be so fun for both kids and adults alike. I absolutely need this in my life. This 100 Inch Projection Screen is $30 on Amazon . Hang it like a hammock between two screens and you are set! What a creative way to add an outdoor end table to your deck or patio, just use a terracotta pot and saucer and you’re good to go. Of course, with an awesome backyard, you’re going to need some extra seating, this is a great way to add a quick and easy bench. In my humble opinion, a firepit is a backyard essential. Best of all, it’s something you can make yourself and enjoy in a day. What’s better than a rope swing? Nothing. That’s what. I had one as a kid and I can’t wait to make this for my kids this year. Have a Pine Rounds 1x12x12″ on Amazon delivered to your door, then simply drill a hole in the center of your round. Tie a knot on one end, and use a carabiner on the other end and hook it to a rope that is secured around a large branch. This is pure genius. It’s a table that props up when you need it, and folds down when you don’t. It’s easy to install on your back fence, which gives you a perfect little spot to put down a drink, food, toys, or anything else you’re sick of holding. Genius backyard project! Looking for a little update without a major overhaul? Paint to the rescue. How cute is this little patio with just the addition of some bright colored paint?! I love the idea of a sandbox in the backyard for kids to play in. I’d love to put one of these together. I know my kiddos would absolutely love it. Update your planters with a little bit of paint! These black and white planters with modern designs are sleek and stand out bright and bold and beautiful. 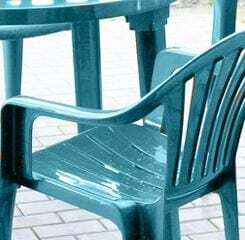 Give your plastic lawn chairs an update with a little bit of spray paint. All of the sudden something old looks new again and you’re ready for a whole new summer. Learn how to do this correctly here at paintedfurnitureideas.com. She has great tutorials on how to paint everything!